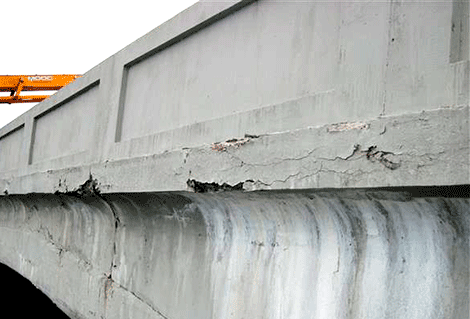 Loose concrete on the Lafayette-Spring Street Bridge has presented a safety concern for boaters on the Oswegatchie River. The city is seeking a $1.5 million to pay for rehabilitation of the structure. Photo courtesy of the City of Ogdensburg. OGDENSBURG -- Ogdensburg City Council will seek a $1.5 million grant to assist with the rehabilitation of the Lafayette-Spring Street Bridge. The bridge was constructed in 1916 connecting the east and west sides of the city with reinforced concrete. In October 2016 a general bridge inspection reported loose concrete that presents a hazard to boating traffic. According to a memo issued by the city planner, funding will allow the city to address these concerns, making repairs to the concrete and painting of the inside and outside faces of the walls/parapets. Council agreed to seek the grant at the Monday council meeting. The BRIDGE NY program provides funding to local governments to rehabilitate and replace bridges and culverts. Particular emphasis will be provided for projects that address poor structural conditions; mitigate weight restrictions or detours; facilitate economic development or increase competitiveness; improve resiliency and reduce the risk of flooding, according to the city planner’s memo. Eligible projects must range between $250,000 and $5 million. The project proposed by the city is estimated at $1.5 million. It would include repairs recommended in a 2016 general inspection. The cost estimate includes design, engineering, right-of-way, construction and construction inspections. According to the resolution the grant would pay 95 percent of the project cost leaving the city with a 5 percent or $75,000 contribution. According to the city planner the city’s contribution would be paid for out of the city’s street maintenance account. Because the $1.5 million grant is reimbursable, the city would likely have to borrow the funding up front, then pay off the loan once the grant is received.